I am an Alaskan Native and I have to tell you folks, I love to moose hunt! September 13th, 2013.. my dad and I were out hunting on the Nushagak River drainage, we were idling in a slough with our skiff being quiet, on the lookout.. I showed my dad where to go and we stopped on the right side of the slough. We walked in lil ways where I have seen moose signs and scraping so I gave it a shot.. Did some cow calls, 6-8 mins apart. After I did those cow calls, we barely and I mean barely hear a bull grunt off in the distance. I looked back and whispered to my dad," Did you hear that??" he said no.. soooo, after a couple mins of what I thought was a bull grunt I started bull grunting and raking continuously, then that's when I started to realize there was a bull coming.. it was late at night, I started bull grunting and raking around 9:05pm that night and that's when we were able to hear that bull grunting and raking too. So me and my dad just stood there where there was that fresh scraping sign waiting for it to come in, every single time it grunted, I grunted right after it and every time we heard it raked, I thrashed the trees with a scapula for like 5 seconds. We stood and that spot till it was 9:24 pm and that's when we started seeing the bull coming in..
All we seen were the horns above the trees and it was huge.. It was hard to see because the sun had went down around 8:40-8:45pm and by the time we seen the bull it was dark like you had to squint your eyes to see better. That bull probably had gotten to like 20 yards away but unfortunately, that bull got away. After that hard day of hunting on the 13th, my dad and I went back out to the same slough to check if it was still around but it was long gone. So my dad and I, we were riding on the river with our Honda 50 jet w/ 18' flat bottom. We went up further that slough and there was this small creek on the right side of the river, we looked in as we were passing. We probably had seen up to 6-8 cows so we stopped up in this other slough above the creek and I started to bull grunt but there was nothing. So we just started idling back down to that creek and as soon as we started to idle in that creek those cow moose just started running all around us, running through the trees, crossing the creek. There was this huge birch tree to the right of me as we were idling in that small creek, that creek wasn't that wide either, like the length of our skiff. As we were reaching the huge birch tree I was watching those cows to check if there was any bull by them and in the corner of my eye, all I seen was a BIG BIG BULL and it surprised me because it was really really close. It stood up from where it was laying by the edge of the small creek. I couldn't get a chance to shoot because I was just shocked seeing it that close to us. It had to been like 4-5 feet away when it stood up and started running away. It kind of disappointed cause I didn't even get a chance to shoot. That bull looked like to me it had to be around 75-80 inch bull. This day, both my parents and I went out hunting, riding around driving through creeks, and I have to tell you guys, we rode all day with the skiff stopped in every slough, creek, swamps, and there was absolutely nothing every time I called.. It was getting late around 8:00pm or so we started heading back down the river and I started feeling that I wasn't going to catch a bull this year. Driving down in every creek, and this probably had to be the last creek that was on the right side going down. My dad asked," you want to go in there son?" I never answered because I just lost the feeling of not catching a bull so my dad turned into the creek. 4-5 bends later driving in that creek there it was! A big bull standing right along side the left creek. That bull wasn't even scared we drove right up to it stopped and started shooting, of course for that size of a moose, it took me 3 shots with an 30-06 Springfield to drop it. I was sooooo happy I dropped it along side of the creek. it was an 71 1/2 in bull. 5 mins later, my cousin Travis Tunguing happened to be close by he heard me shooting, he came to see us in the creek with his skiff with a Yamaha jet. 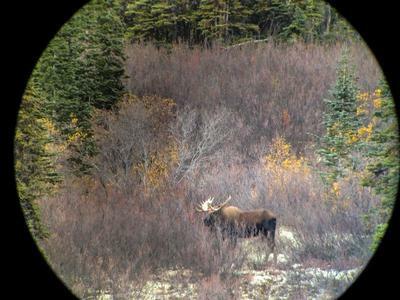 Soon as he stopped by our skiff, he couldn't believe how big of a Bull moose I knocked down. He got to excited he parked the skiff grabbed his tape measure and jumped out of his skiff. He had a one of his work friends in the skiff and he started to drift away and I told Travis but he was to excited to see that big bull so I walked out in the creek a lil ways and grabbed his skiff. That guy said thanks and I said no problem. Brought him back by our skiff and tied him off. I walked back over to my bull and my cousin was still there looking at the bull. Then we straightened out the bulls head and finally measured with his tape measure.. it was an 71 1/2 inch bull.